The POE-GSH2004L-370 is a 20+4-Port Gigabit Ethernet Web Smart PoE Switch. It can automatically detect the presence of an 802.3at/af compliant powered device (PD) and provide power through the port. 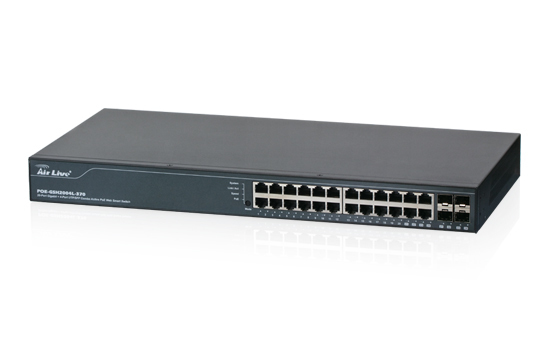 The switch provides up 30W per PoE port and can be used to power AP, IP phone, IP Cam and other PD devices. After enable and set up the Device Guard function, the switch can monitor PoE IP Cameras and Access Points for activities. When a device crashes and not responding, it will reboot the device automatically. It keeps your wireless and IP camera network running smoothly without the need to send expensive technician for service. Through the Web browser, you can configure POE-GSH2004L-370 such as System Information, Ports Configuration, VLAN setting, Aggregation, QoS setting, RSTP, IGMP Snooping, Mirroring, SNMP, Loop Detection, Broadcast Strom, configuration/ backup/recovery, log out. We also provide another way to control your POE-GSH2004L-370. With the attached Web management Utility, you can easily discover all the Web Management Switch, assigning the IP address, changing the password and upgrading the new firmware. Furthermore, with displaying PoE Status via WebUI, you can easily monitor power consumption of Switch, control power limitation of port to the powered devices, and enable or disable the PoE function of the selected port.